Most milestones, like crawling, walking and talking are pure excitement. Teething, on the other hand, can be both exciting and a rough ride. It’s undeniably adorable to see that classic two-bottom-teeth smile, but getting there (and to all 20 teeth, whew!) can be painful for your little one. Your baby was born with a full set of fully-formed baby teeth, nestled below his gums. Most babies’ first teeth appear when they’re between 4 and 6 months old, but the range is wide. Some babies begin teething earlier, and others don’t get a tooth until they’re a year old or older. If you’re concerned about your baby’s teething timeline, check in with your pediatrician or a pediatric dentist. Baby teeth typically appear in pairs, and in the same order for all children: Bottom two middle teeth, then top two middle teeth, then side and back teeth. By age 2, most children have all 20 baby teeth. The American Dental Association provides a handy chart showing the approximate order and age at which baby teeth appear. 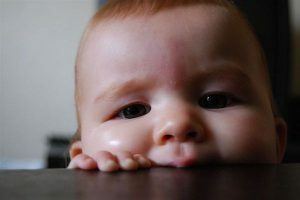 Every baby is different when it comes to teething; some sail through it without issue, others have every symptom possible, and others are somewhere in the middle. A desire to gnaw or chew. How Can I Help Soothe Teething Symptoms? Wet a clean washcloth, put it in a plastic bag, and put the bag in the refrigerator for an hour or so. Take out the washcloth and let your baby chew on it. The texture of the washcloth, along with the cold temperature may help. Try a teething ring. Dentists tend to recommend solid teething rings that still have a little give. You can put these in the fridge to cool them down, and some even have a textured surface. Liquid-filled models are designed to be frozen, which may damage your baby’s emerging teeth or even leak. Try gently rubbing a clean finger or the back of a spoon along your baby’s gums. The FDA advises that gels containing benzocaine (Baby Orajel, for instance) not be given to children, especially under the age of 2, as they can cause rare but serious side effects. Similarly, the FDA discourages the use of homeopathic teething tablets due to questionable amounts of potentially-dangerous ingredients. While aspirin can be dangerous for children, infant acetaminophen and infant Ibuprofen are generally considered safe medications to give your baby during teething. Be sure to talk to your pediatrician before you give your baby any medication or supplements. Even before your baby’s first tooth appears, it’s important to take care of his mouth. Find out how here.